To be fair, I have no cocktail dress with me, and I could only drink virgin cocktails at the moment anyway. And honestly, I do not have the energy! Hopefully this gives you, dear reader, an idea of the scale of this thing! Day one of the conference started off relatively relaxed. The programme stated that registration was any time between 9.30 and 1.30 so I took my time to get over there. Lorena ordered me a taxi (I did suggest I could walk it, it’s really not that far, but she looked horrified and bundled me in the cab!). Good thing too, I sincerely doubt I could have just walked in to that place. I got scanned and my laptop bag checked as soon as I walked in, and was given a plastic card as soon as I registered, so that I could swipe in and out of the building. And enormous ringbinder full of information appeared in a specially printed hessian sack – with room for me to collect the multitude of coffee-covered leaflets thrust in my general direction later on. Despite the enormity of the event, it seemed a little chaotic, in that there was virtually nothing to say where you were supposed to be headed. The general throng of people in business suits (mainly Latino, a few African delegates, but us gringos were certainly in the minority!) seemed to be rushing upstairs, but I couldn’t really see why. Finally a rather outgoing Peruvian woman took pity on me, started talking and together we eventually figured out where we were supposed to be. 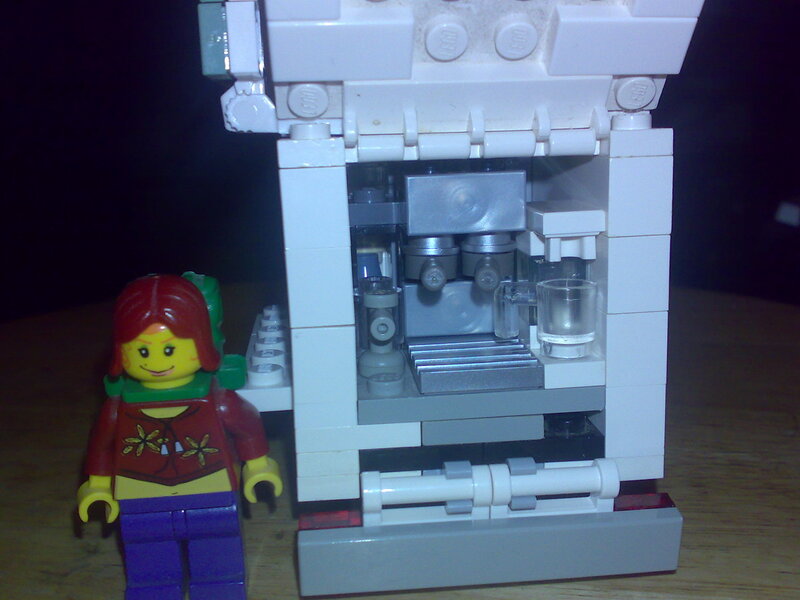 Her name is Carina, and she works for one of the rural microcredit schemes operating out of Lima. I told her I lived in Huancayo for a while, and immediately I was her friend for life. She thought she might be the only Peruvian there. I tried to find a Wifi signal in order to phone Carl – the conference didn’t officially start until 2pm, so I had time, and given the 6 hour time difference it was the only time I could call when he wouldn’t be in bed. But no wifi. Well, wifi, but the sort of Wifi that the Hotel Camino Real wanted to charge me $10 for the privilege of using. Not gonna happen I’m afraid. Bah. Instead, Carina and I wandered round the exhibition hall, where numerous companies all vaguely related to coffee (roasters, several importers, cooperative associations, microcredit schemes, Rainforest Alliance, several companies offering biological warfare treatments against coffee weevils and a company selling the Oliver sorting machines) paid at least $10,000 to show off their stall and hand out leaflets. Carina noted, disappointed, that there wasn’t a single stall from Peru. Neither was there any mention of African or Asian coffees, everything was Central and South America. I did find Mercanta – the UK based importers, and chatted for a while. They know Pumphreys very well, and also Pollards roastery in Sheffield. Their stall was covered in very posh looking tubs of coffee from Fortnum and Mason’s! The rep was wearing a waistcoat made out of a coffee sack, and was keen to assure me that they only bought from small scale producers of the highest quality coffee, and there’s was the most ‘direct trade’ you could get. This I don’t understand – the whole point of Direct Trade, to my mind, is that the coffee retailer – ie: Doctor Coffee’s Cafe, buys direct from the farms, cutting out the middlemen, ie: the importers. But there we go. I was beginning to feel more than a little light headed – everything was very rushed and intense and I really had to concentrate on the Spanish the whole time. Fortunately I was saved by LUNCH. Lunch was amazing – grilled snoek (which I thought was typically South African?) in mango and chilli sauce, with rice, spinach and aubergine, followed by a luridly pink Sapote and chocolate mousse. I actually can’t remember what Sapote is in English, but it was delicious whatever it was. We were joined on our table by three Guatemalan journalists, and also two journalists from Cuba. I found it very hard to talk to the Cubans, their accent was very different to any I’d heard before, and they spoke so fast. I didn’t even catch their names! One of the Guatemalan journalists was called Antonio, and he was especially chatty. He grasped the fact that I was only understanding the general gist of the conversation rather than being entirely fluent, and used this to basically take the piss all the time (in an amiable fashion.) I found it all a bit like hard work to be honest, but talking to anyone is still interesting! Then, we were all ushered into the main conference hall, and struggled to actually find a seat (the metaphorical pregnancy card – ‘tarjeta de embarazado’ came in useful again here!). The place was PACKED. I should have realised from my lunchtime companions that this was a huge press opportunity as well as a coffee conference. There were TV crews, reporters frantically scribbling, loads of papparazzi with enormous cameras – from all over the world too, not just the local press. I ended up sitting next to an American journalist who said he was covering the event, but he was also writing a book about caffeine. Interesting stuff! Unfortunately for him, his Spanish was worse than mine, and he had major difficulties keeping up. We were given little earpieces, where we could plug in and hear the translations, but I found it really difficult to listen to the American woman whispering in my ear whilst simultaneously watching a bloke in front of me speak Spanish, so I gave up and took notes as best I could in Spanish. A huge amount remains to be translated later – probably on the plane home! 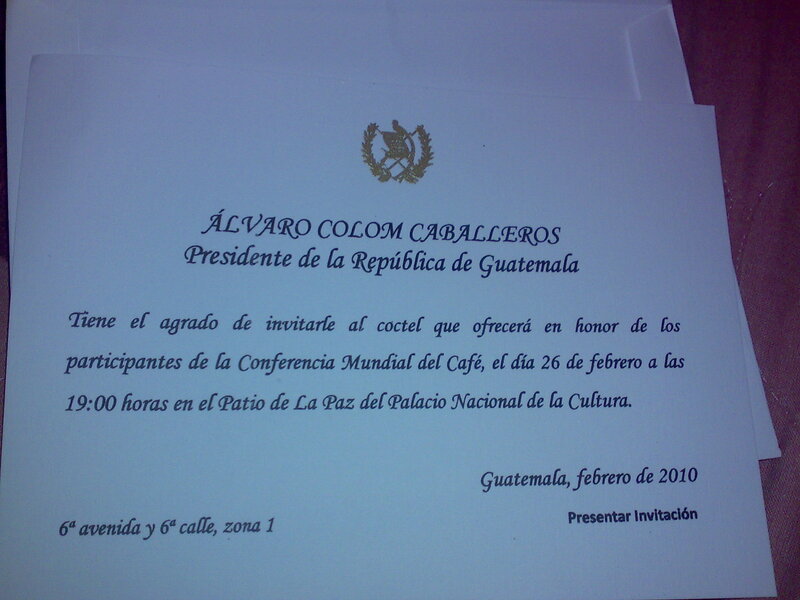 The conference was officially opened by the President of Guatemala, Alvaro Colom Cabelleros. After his speech, came another from the President of Honduras. This freaked me out totally – I had NO IDEA this was such a big deal. Then there was the President of ANACAFE (the national coffee association here in Guatemala), then the head of the International Coffee Organisation, then someone from the Communal Fund for Basic Products (which I didn’t know existed), and finally, there was supposed to be someone representing a cooperative project between Guatemala and Jamaica. Only he got lost and didn’t make it. Quite a relief actually. Out of the five speakers we did hear, only one presented in English. My brain started to hurt A LOT. All the opening speeches ground to a halt after 4pm, and we were told to check out Welcome Packs for invites to the Cocktail Reception starting at 7pm. I ignored this, having given myself a pretty bad headache. Carina wanted to get back to her hotel as well, so we decided to share a taxi back. It took us nearly 45 mins to find a taxi though!! The Presidents’ entourages took up the entire road on three sides of the hotel – loads of Mercedes with blacked-out windows, escorted front and back by 4×4 trucks, each with at least four guards with enormous rifles standing in the back of them. No other traffic dared go anywhere near!! I have never felt more out of place! We finally did find a cab which dropped Carina off quite happily, and then promptly got lost trying to find the Dos Lunas hostel (I am not in the expected touristy area it seems – with good reason!). I got in absolutely knackered again, but did realise it was still early enough to call Carl. So I did and stories of mischevious ferrets helped me unwind no end. Even so, I still fell asleep in the hammock again, and woke up at 6.45pm. It was only then that I started going through all the giant ringbinder of conference material and discovered the gold crested presidential invite to this cocktail reception. Frankly, it was never gonna happen. The allure of the hammock and Lorena’s tempting ‘salsa picante’ covered chicken was too much. I’m sorry, Mr President. 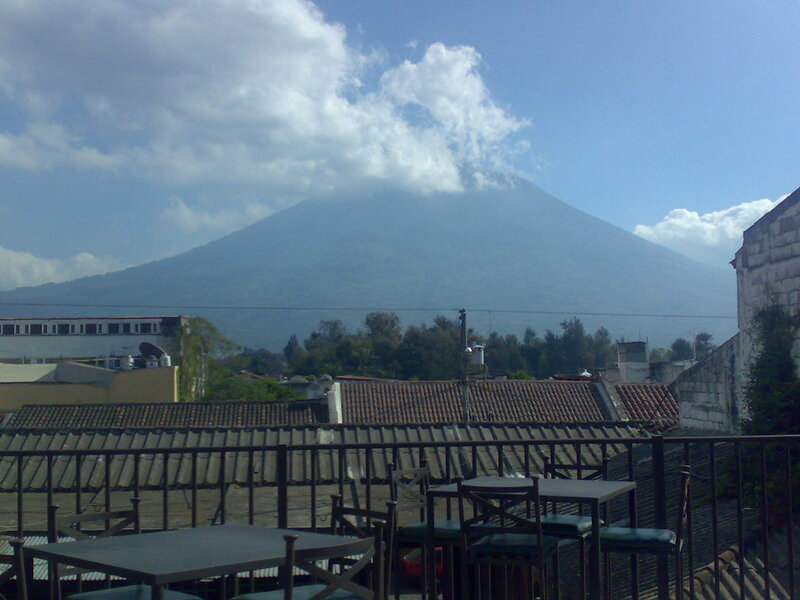 Antigua – Coffee Capital of Guatemala? This world is officially FAR too small. I came down to breakfast this morning and met the hostal’s only other guest at the moment – a bloke who’s name I have instantly forgotten, although probably ‘Mark’. Bloke had an American accent but Lorena insisted that he was from Durham. Durham, North Carolina maybe? Noooooooo. Our Durham. He’s doing his PhD at Durham university. About volcanoes. He gave me a few tips for today in Antigua, since of course all the volcanoes he is studying here in Guatemala happen to have coffee growing on the sides of them…. He was leaving this morning, but I said I could catch up with him ‘back home’ – aaaaaaaaargh. If that weren’t enough, I drank some coffee this evening which had apparently been certified as organic, by MayaCert. Not wholly unsurprising given where I am, but I met one of the reps from MayaCert when I was in Matagalpa, Nicaragua, and interviewed him for my project. The coffee he approves gets my approval too! And so to Antigua – as in, the old colonial city about an hour from Guatemala City, NOT the Caribbean island sadly. Still absolutely glorious all the same. At risk of saying ‘everything is like everything else’, Antigua was very very like Granada in Nicaragua. The city is centred around the main plaza, full of palm trees, street vendors, and a fountain in the middle. The standard, completely over the top Catholic cathedral dominates one side, and hundreds of narrow cobbled streets lead out from this plaza on a sensible orderly grid system. In theory. 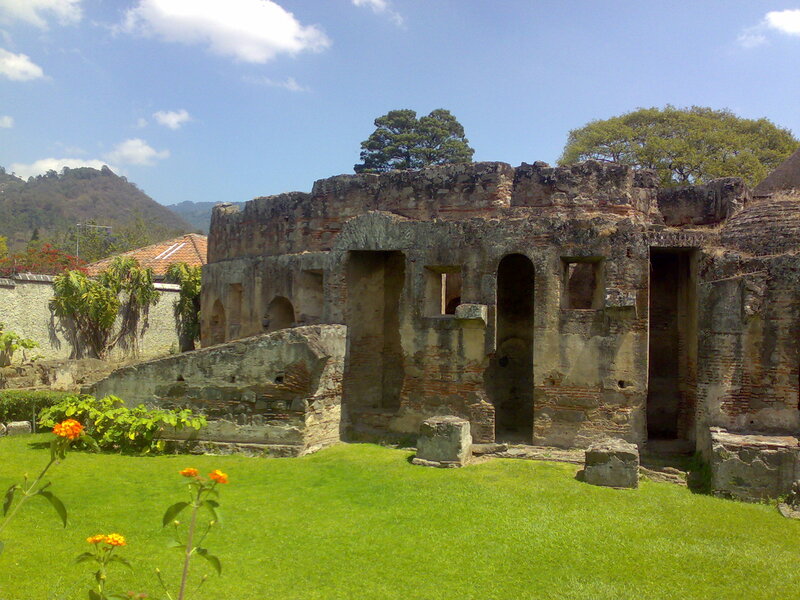 Unlike Granada, Antigua has been hit by numerous earthquakes which means the grid system isn’t as neat as it once was! It is quite high up too. I am not sure of the altitude exactly but my ears popped a few times during the drive over there (in Victor’s Hippy Bus again, the hostal offered a shuttle service.) 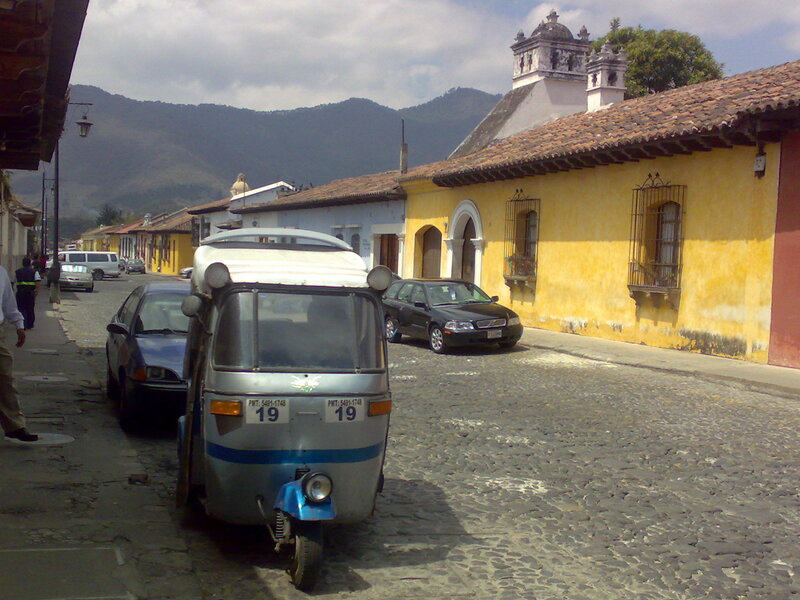 The beautiful, conical Volcan Agua overlooks the whole city, while several other mountains surround it with coffee growing all over them, and Ape-like mototaxis transport gullible tourists around. Although I appreciate their cuteness still, ownership of one means the novelty of tiny mototaxis has now worn off! I got my first coffee of the day in Cafe Condesa, and very good it was too. Guatemalans are very proud of their coffee – rightfully so as well, but what makes it exceptional is that they take time to learn how to brew it as well. Loads of places do filtered coffee (and very few people seem to drink instant – woohoo!) but there are also quite a few nice little cafes with espresso machines and trained baristas. And not a Starbucks in sight! When the good stuff grows on your doorstep, why would you want that stuff? I made a new discovery today too though. Coffee is not the only wonder-crop growing near Antigua; the other favourite is proper *chocolate*, or at least, cacao. All the coffee shops and restaurants served hot chocolate, which is absolutely divine: very strong and thick, not incredibly sweet but extremely rich, with the sweetness coming from added vanilla and cinnamon rather than too much sugar and milk. I had an absolutely enormous lunch (spicy beef stew, served with rice, tortillas, a maize tamale, guacamole and salad) and decided to have my cup of chocolate as dessert. The waiter told me it was made with 80% cacao. That stuff ought to be illegal – in the absence of booze and whilst having to cut down my coffee intake, Mayan chocolate is my new drug of choice!! 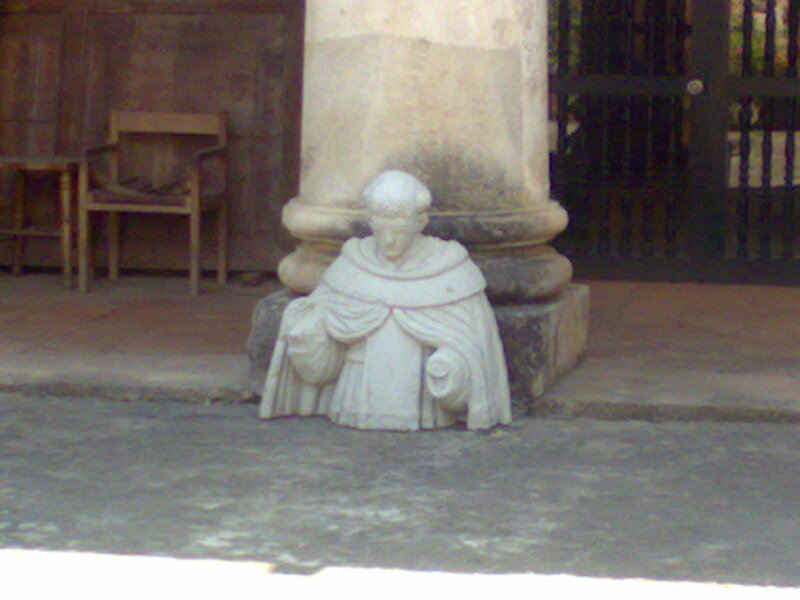 Coffee adventures led me, in my literally-minded way, to the old Capuchin monastry. Apparently, a bunch of (originally Italian, I assume) monks who shaved the tops of their heads, gave their name to the coffee drink: the bald white top of the head looks like the milk with the circle of hair being the brown espresso round the edge of the cup. Either that, or they were a whole group of caffeine addicts and named themselves after the drink, you never know… But anyway, in Antigua, there is the remains of a 17th century monastry that was destroyed in an earthquake several hundred years ago. The monks moved out, but now there is an initiative to restore the stone building (partially sponsored by a Taiwanese organisation, bizarrely, there was even an exhibition of Taiwanese art there today!) and part of it now houses the ‘Museo de Capuchins’ – but sadly no coffee shop. The ruins were stunning, particularly as it was so sunny. There was a beautiful walled garden full of purple flowers, odd statues and the circular monks quarters with a small stone cell for each inhabitant. Completely surreal acoustics even though the roof was still missing. Given it was in the middle of the city, it was strangely quiet, very peaceful. I found an underground chapel that had been newly white washed, and the stone walls meant it was lovely and cool compared to the tropical temperatures outside. I wandered around for a good hour or so; there were virtually no signs or explanations of anything in there, so most of the time I had no idea what I was looking at, but it was all so relaxing, I enjoyed it anyway. Somewhere in the process of all this, I got extremely, painfully sunburnt. I didn’t realise (as ever) that the sun was so strong – it was hot, but not incredibly so, but it was the altitude that got me – the sun is stronger when you are closer to it, obviously… ahem. I spent my last hour in Antigua in yet another very good cafe drinking a bucket of pineapple juice, I am sure it was nearly a pint of the stuff! 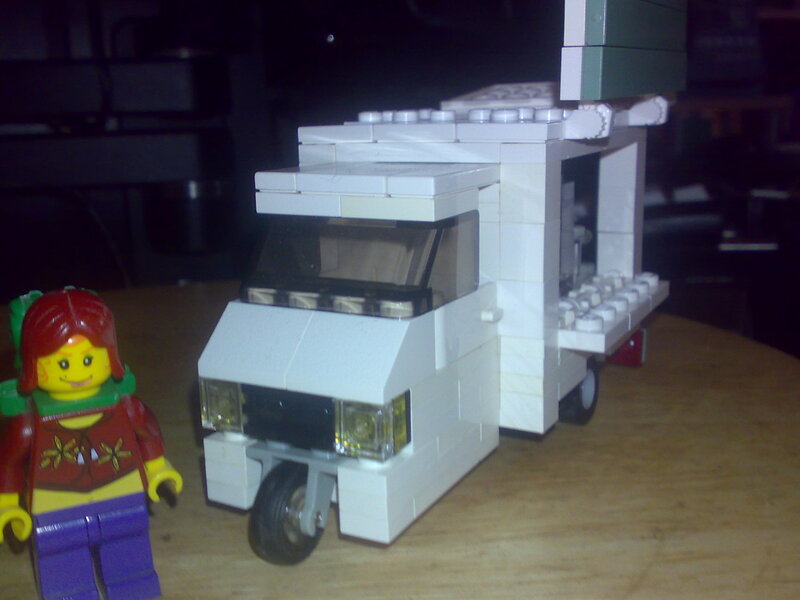 Then Ernesto, Victor’s colleague, appeared in the van to take me back. I tried talking to him as much as I could on the way home as I was so tired I would have fallen asleep without distractions. He was asking about the baby and recommended girls – in that he had two daughters and a son, and his wife swears blind their daughters were easier to cope with as babies! I was absolutely exhausted though, so as soon as I got in, I had a cold shower to cool off my bright red shoulders and collapsed in the hammock with Gabriel Garcia Marquez (yes I have FINALLY got round to reading that!!). Another amazing, tiring and unique day. I really am so, so lucky to be able to experience all this and to have opportunities like this. I feel so free out here. The conference starts tomorrow, so I will do my utmost to make the most of it – it is the real reason why I am here after all. I ended up actually running across Miami airport this morning (mentally checks – yes, it was this morning) after finding that I had less than 30 minutes between the New York-Miami and the Miami-Guatemala City flights. As well as half-killing my already exhausted self, this also meant that I had no time to acclimatise to the slightly warmer temperatures in Miami. So I got off the plane in Guatemala City (seeing plenty of signs and official looking people involved with the coffee conference – this is a big event!) and walked into a heat wave! It was at least 25 degrees, and we landed at 11.30am, so I reckon it must have topped 30 by the time I’d got to the hostel and unpacked. Really humid too, it’s like walking through a warm bath. I always find it incredibly relaxing for about the first hour, and then begin to suffocate! Even those sensations are oddly familiar now. Victor, the hostel’s driver in residence, picked me up in what they call “the hippy van”. This is a genuine 1974 VW camper van, in bright red, and very untypically for Central America, they’ve actually kept it in pretty good nick. The same can’t be said for the rest of the traffic though: Victor had to guide me through the Squabble of taxistas (there is no better collective noun, believe me) at the airport all trying to get me to take their particular decrepid cab at various double-for-the-foreigner prices. The roads are very wide, with no road markings at all, and sometimes they suddenly become unpaved with no warning for the sheer hell of it. The horn on every vethicle is in perfect working order – unlike everything else, and is used to communicate the intentions of the driver in the lack of indicators, concepts of ‘right of way’ or indeed, common sense. And interweaving between all of these were entire families perched on tiny 125cc motorbikes, girls in heels on the back, blokes just in t-shirts and no helmets on anyone. Just like every other Latino city I’ve visited, in fact. I love it. 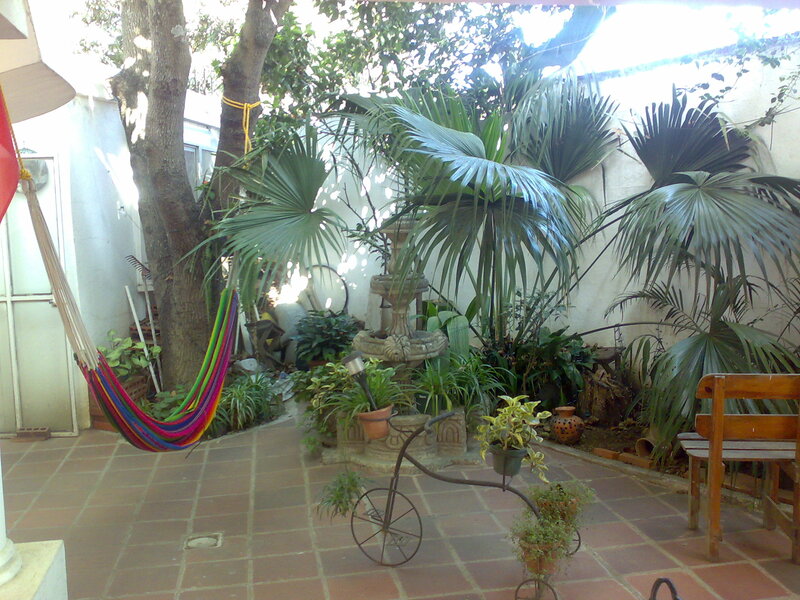 The hostel, Dos Lunas is lovely. Old colonial building, tiled floor and white washed walls and HAMMOCKS! Woohoo!! Lorena, the owner, forcibly mothers everyone, took one look at my bump and then informed me that I really ought to have one of the private rooms, and she’d discount me $5 a night to make sure I took it. Can’t argue with that really! My room is light and airy and miraculously mosquito-free and the bed feels WONDERFUL after all the travelling. And guess what? 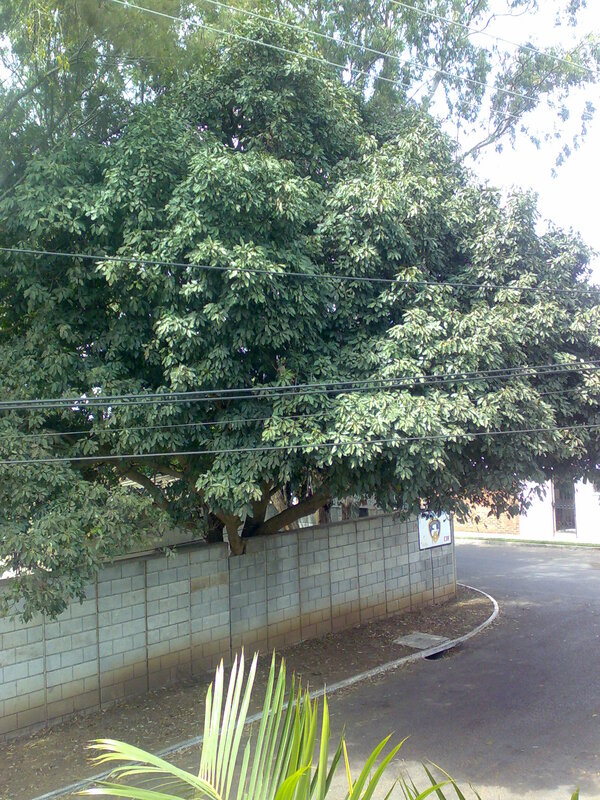 There is a huge, 10ft tall robusta coffee tree right outside my window. I braved a shower in order to feel human again, and of course it is one of those dangerous electric ones where the water is heated by having an electric current passed through it. Great design really… especially when the showers are all at Latino height, meaning to avoid touching the metal shower head and getting a shock, I have to limbo dance underneath it. Again, something I have got quite used to now. 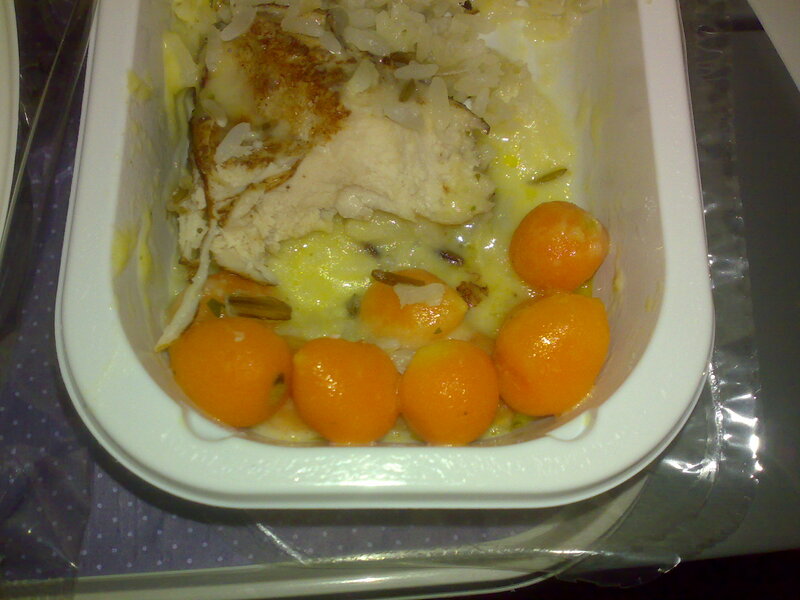 I made “I’m staaaarving” type noises – I really was, there was no breakfast of any description on either flight, which I was a bit miffed by. There is a little “restaurant” here – meaning Laora, who I think must be Lorena’s daughter, cooks things to order when you ask her to. However, she doesn’t start food until 7pm, so I asked if there were anywhere local I could go get a snack. I was told to go two blocks to the right, look for a building with “Prensa Libre” painted on the side, and then ask for Mario, who will make me something. So I did, and he did. The building actually houses a tiny weeny kiosk shop selling cans of coke and packets of biscuits and small satchets of shampoo, and individual cigarrettes -as there is on every corner. But when I asked for Mario, and said I was staying at Dos Lunas and that Lorena sent me, it was if the secret password had been spoken. I was ushered round the back into the guy’s own backyard, I think, sat me down at the one and only table and asked if I liked chick peas. A few minutes later, a massive plate of food – chickpeas and chorizo in spicy tomato sauce, and rice, and salad and fresh warm tortillas, and fresh chill sauce and coffee – appeared, just for me. He even put on his favourite ABBA cd, I think in my honour at being the only Gringa he’d seen in a while. He watched me eat and chatted, and I said I was planning on wandering round to see if I could find the Mercado de Artisanias. Of course, there was a bus, and it just so happened that he was going to catch that bus himself into the centre, and would I like to accompany him. Well why not? This chicken bus differed from the normal chicken bus in that it was red, but a trip across town cost me 1 quetzal – under 10 pence, anyway. The seats had long since collapsed and had been replaced with planks of wood, but it got us there. The Mercado was (as I should have known) a very dangerous place. Not because I was likely to get robbed, but because everything there was gorgeous – handwoven multi coloured traditional fabrics, hammocks, soft leather bound notebooks, bags, and Guatemala is famous for its jade appparently, so LOTS of lovely jade jewellery and little green carvings. A toothless old lady in her bright stripey tunic and hair in plaits sat with a loom weaving a huge purple table cloths, and insisting she could make anything in the colour I wanted for “one extra dollar!” I couldn’t resist, I did buy something – an obscenely cute, tiny, hand-embroidered, purple dress for the Cheese, in the traditional Mayan style! Well, I’m unlikely to find something like that in Mothercare, am I? I also found, in the middle of the market, ‘El Rincon de Cafe’ – the coffee corner, which sold amazingly good coffee, grown down the road, from a small espresso machine powered by a noisy generator…. sound familiar?! I found my Guatemalan double, Katia the Barista. I decided to walk back since Lonely Planet’s map seemed to imply it was only a few blocks and the bus ride hadn’t seemed too long or complicated. I needed to walk somewhere after so long on the planes too! Typically, I got lost though (I am losing faith in Lonely Planet, although this one is nowhere near as bad as the fateful Footprint Guide to Costa Rica, fortunately!). The one thing I can say about Guatemala City which is not true of the other Latino capitals in my experience: it feels A LOT safer. Walking round in circles did not feel remotely dangerous (like Managua does) and certainly not as intimidating (like San Jose). I do get a lot of attention, perhaps unsurprisingly – there are very few other foreigners around, and of those, even fewer are on their own, nearly 6 foot, red haired and quite obviously pregnant – but I didn’t get anything like the hassle off the men as I’ve come to expect, even when explaining I was lost whilst four blocks from where I was staying! (DOH!) Guatemalans seem to be a lot more reserved, there is none of the hissing and yelling to get your attention, and of the few I met this afternoon, I found that they chat amicably when you initiate the conversation, but won’t start of their own accord. I asked Mario what the local name for white girls was – like Chela or Macha or Gringa, but he said there wasn’t one typical to Guatemala. They use Gringo/a if you speak only English, refer to anyone not speaking English or Spanish as ‘turistas’ and anyone like me as ‘extranjera’ – stranger. But none of those have the same derrogative connotations as the annoying ‘Chela-chela-chela’ calls in Nicaragua. Does this imply less of a Machista culture? I really hope so but I won’t hold my breath! I am really glad I have this couple of days to actually see a tiny bit of REAL Guatemala – I doubt I’ll be meeting many local people at the conference somehow. I spent the evening lounging in my hammock talking to Lorena, Victor and Laora, who were intrigued as to why I came all the way to Guatemala for a week, just for a conference. I have no idea really – there is soooooooo much to explore that I really really wish I had more time. They told me that Antigua and Copan are the best coffee growing areas (all volcanic, unsurprisingly), and that they don’t think much of their President (Lorena actually made vomitting noises!) when I said he is opening the conference on Friday. They also asked if I was a “compradora” – a coffee buyer, into importing the stuff or something. I was highly tempted to say yes – on a very small scale I am, at least. 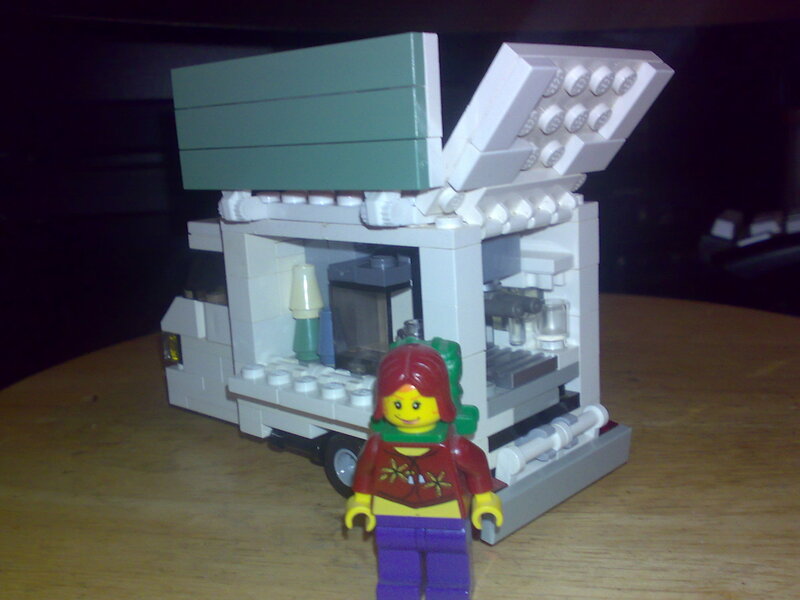 Hell, maybe I should be: expand on the Doctor Coffee business (Lorena LOVED my photos of the Ape van! ), and start importing fantastic coffees to sell as beans as well as just in drinks…. then a few trips out here every year to sample and stock up… yus, I could definitely fancy that!! Could even get my thesis published and sell that to fellow coffee geeks! I’m writing this blog at approximately 38000 feet, 2432 miles from New York. Obviously I can’t upload this until I can find a Wifi signal in JFK airport, but I am in need of entertainment now – otherwise I’ll have to watch Star Trek again. At risk of speaking too soon, the whole journey has been relatively painless so far. I did have to take my boots off twice for customs, but sadly even though Heathrow have the new possible-not-legal body scanners, you can’t actually see yourself on them. I was naively hoping that if they are actually as privacy-invading as the Daily Mail would have you believe, I may be able to catch a glimpse of the baby again! Free 23-week ultrasound maybe?? But no, if the security staff actually could see through me, they certainly weren’t about to let me in on the view. If that lot of security procedures weren’t silly enough, I have yet to find a use for the bloody ESTA Visa Waiver thing either. I conscienciously filled out the Electronic System for Travel Authorisation online last week – as it tells me to do on the bottom of my ticket. This was hard enough because finding the damn thing online isn’t easy. My frustrated searches for “Stupid US Visa Online Thingy” resulted in quite a few pages but not the one I was actually looking for. The ESTA is basically the little green visa waiver card that flight attendants usually hand out when you are actually on the plane; the one that asks if you are entering the USA to engage in criminal activity or moral turpitude, or whether you were involved in persecutions associated with Nazi Germany between 1933 and 1949 – after asking you your date of birth. You can supposedly fill it all out online, and receive an ESTA reference number which you can use instead of the form when you get to the US. But noooooooo. Despite me and the guy in front of me on the plane explaining that we’d already filled it out and proffering our reference numbers hopefully, we still had to do the whole thing again on board, on the same all green forms that they’ve been using for at least the past decade. Daft. I had half an hour to kill at Heathrow, and the cheapest, non-vending machine, non-Starbucks coffee was to be found at Krispy Kreme. For all UK people, that means a strange American ‘doughnut bar’. I tried my usual Americano, (‘medium’ was £1.80 for a cup about the same size as a grande in Caffe Nero – and given this was an airport, that isn’t too badly priced.) Genuine espresso topped up with hot water, no filter or instant crap. Not exactly astounding and not as strong as Caffe Nero (two shots of espresso, not three) but I have had considerably worse! I did finding myself longing to dunk a sticky glazed doughnut in it though, which was probably the intention. Coffee on the plane is dire. I tried one, it was foul and very bitter. So the next time I asked if they had de-caff. They do, but only instant de-caff, implying that the stuff I had just drunk wasn’t instant! Which of course begs the question, what on earth was it?! Very old stale filter I can only assume – or hope. Scrub everything I said about the “easy journey”. Gaaah. Nothing (yet) has actually gone wrong, but ye gads I feel terrible. As mentioned before, no doubt very noisily, *I have a horrible cold*. This meant that when coming in to land in New York, blocked sinuses did not cope well with descending air pressure and I honestly felt like my head was going to explode!! OW OW OW! Left me with an Orrible Eadache, which didn’t help with the whole experience of trying to sleep at an airport. My body clock is royally screwed up as technically I arrived here at 9pm New York time, yet to me, it was around 2am UK time. This next flight to Miami leaves at 5.45am meaning I have been here nearly 9 hours after a 6.5 hour flight, and can’t have had more than four hours ‘doze’ (I can’t say ‘sleep’ as such) lying on a padded bench. And I’ve still got two flights to go. Why do I do this to myself???? Take the National Express, when your life’s in a mess, it’ll make you smile…. National Depress buses have definitely improved. NEVER thought I’d say that. Apart from the thing turning up half an hour late (because of a hold up in Newcastle, apparently, not actually because of the snow as suspected!) this hasn’t actually been too unpleasant a journey. There are even seatbelts nowadays (bit of a squeeze over the bump though!). Two very Geordie blokes behind me have done nothing but moan for the past five hours, about everything from the state of Grainger market, to lack of mobile signal, to young secretaries who rely too much on their spell checkers. It’s quite endearing. Across from me was a rather grumpy old woman, occupying the only spacious elderly/disabled/pregnant seat. I made a big thing out of stretching uncomfortably every few minutes, munching marshmallows to signify cravings and making sure she saw the Pregnancy and Baby magazine I bought out of boredom. She took none of my hints, but she did vacate the bus at Milton Keynes so I got the last hour and a half of the journey to sprawl contentedly. The view out of the window is still grey. It’s ranged from dirty snow grey to general motorway grey to London pollution grey, but the distinctions are muted by the fact that the insides of the bus, the seats and the dirt on the windows are also grey. I was keeping my eyes peeled for the elusive North-South divide – from my norther perspective, I mark it from where the first signpost saying “The South” appears on the M1. I missed that today though, so instead I am taking it from the last sighting of cooling towers: That bloke, by the way, is the driver’s mate. Obviously a stressful journey. Wimpy Bar Americano Coffee Is Nicer Than Costa Coffee Americano. Revelations aside, I am now ensconced in Ickenham. Tube journey was orrible. But now there is Chinese takeaway, Jefferson Airplane to play on Rock Band, and general lunacies… Cheese and I got here in one piece. Woopedoo! Right now I may actually be DYING… I am a pathetic snot filled monster, and although Carl is sympathetic, he daren’t come near me for fear of infection. Tiny Cheese, on the other hand, remains completely oblivious and is bouncing around inside me and gaily kicking the back of my navel without a care in the world. (That said, tonight’s activity could possibly be her objecting to the whole-body jarring sneeze attacks!). On top of that, it is cold and has spent all day SNOWING. Again. Not the nice pretty sort, but the slushy, dirty wet stuff that turns everything into a miserable, phlegmy sort of greyness. This is NOT the best start to a hectic week. Tomorrow I have to sit on the iconic National Depress bus for 6 hours to get to Victoria in London, then pay some extortionate amount in order to negotiate the rush hour commute from there to Ickenham to camp on my friend’s sofa for the night. Then, I fly from Heathrow to JFK New York, to Miami, and then finally arrive in Guatemala city Wednesday lunchtime. Right now it is -3 degrees here in Darlo, 2 degrees in London, 8 degrees in New York, 21 degrees in Miami and 28 degrees in “Guate”. It feels very very strange wearing my woolly monster socks and two jumpers in the house whilst packing flip flops and tiny t-shirts and sunglasses. I will have one day to myself (Thursday) in Guatemala City where I plan to go shopping for coffee in the Mercado Central or Mercado Artesanos, (now there’s a surprise!) and stuff my face on proper corn tortillas (woohoo! ), and explore another Latino capital in the vain hope that its not as bad as Lima or Managua, nor as westernised, uninteresting and expensive as San Jose. Then, I am ensconced in the conference . I hope it’s going to be interesting, and despite appearances, I do genuinely believe it will be useful for The Project in some way! After three days of solid conference and the ANACAFE ‘gala’ evening (I packed a respectable maternity dress! eek! ), I’ve got to make the excessively long return journey, leaving Guatemala at 8.30am on the Monday and not returning to my beloved Carl and ferrets until 10pm on the Tuesday…. but hopefully that will give me plenty of time to actually write a good sized chunk of the next thesis chapter whilst in transit….. everything can be justified really! The lovely Anna has been blogging, and partially inspired by this – and by the fact I am taking my laptop with me for the first time – I am going to write up my adventures on here. Watch this space! But you better believe it baby… Nescafe are in fact trying to sell you coffee that is 35% RAW, on health grounds. 1. It is a fair assessment that the process used to create instant/soluable coffee would remove any nutritional value anyway. -> Green coffee beans are inert – the human body cannot digest them. It’s a little like eating raw corn, it just goes straight through you. Instant coffee is made by grinding roasted coffee, making huge batches of filter coffee from it, the boiling and boiling the filtered coffee until only a dry residue is left, which is then put in to jars. This is the only way you can make coffee completely soluable -and also why instant coffee tastes nothing like the real thing. Some companies (and I don;t know about Nestle, so I can’t prove this) – actually have to recreate the smell and taste of real coffee by adding artificial flavourings back in to it afterwards, since the process of making it soluable removes so much of the flavour. This is perfectly legal, and they can still claim it’s ‘made using 100% arabica coffee beans.”… But anyway – roasting is vital to this process, because without roasting, the coffee cannot release any of its oils, flavours, acids or nutrients into the water when making the filter coffee. If you mix water with ground up green coffee beans, you just get water with green beans in it. Therefore, if Nescafe are actually adding 35% raw beans to their blend, it means they’d just end up with instant coffee with a third less flavour than normal. OR, they could be adding the green beans after they’ve made the roasted ones soluable – in which case when you make a cup of this stuff, you should end up with green grit in the bottom of your cup. I shall have to dare to buy some and test this theory. 3. The health claims are also a)entirely unnecessary, and b) entirely meaningless. More on this later on. Nescafe seem to have borrowed a cupper to test their latest product – which is akin to getting a professional sommelier to taste Lambrini. But point being, you can’t taste green coffee for the reasons given above, and you certainly can’t taste anti-oxidants…. Even if anti-oxidants are good for you – there are more anti-oxidants in roasted coffee than green coffee anyway. AND you can actually digest them! significantly greater in roasted samples than in green coffee (7). So, where did Nescafe’s idea come from??? GREEN blend sounds eco-friendly. I bet they couldn’t market it as “Nescafe RAW blend”. It also sounds healthy. People think they need anti-oxidants. The most well-known source of anti-oxidants is green tea. Coffee, on the other hand, has always been accused of being unhealthy because of the caffeine content… so, why not make the coffee green too?? And, I suppose, what really swung it for Nestle was that green coffee is cheaper than roasted coffee, and this way, they can sell a new exciting blend for more money, when it may actually be a third cheaper to produce….